So nobody guessed on the makings of our S'mores cake...either you were totally and completely stumped, or my post was so long, you forgot I even offered the challenge. I think it's most likely the latter! 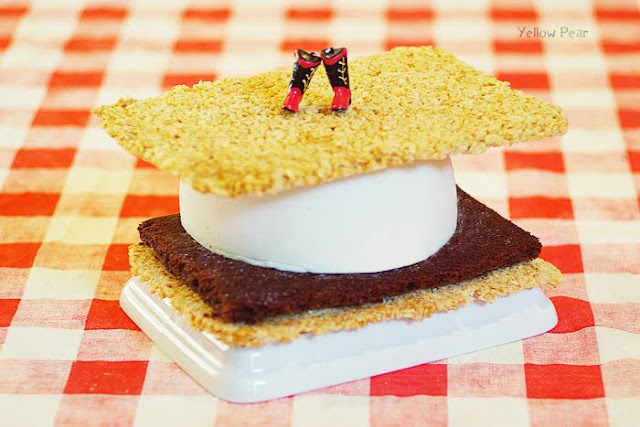 We first toyed with different ideas for the graham cracker top and bottom. We thought of using thin sheets of cake, fondant covered Rice Krispies and finally just figured that Rice Krispies would have good texture all alone. We did use coconut marshmallows to give them a more tan color. I also overcooked the marshmallow mixture to harden the treats. 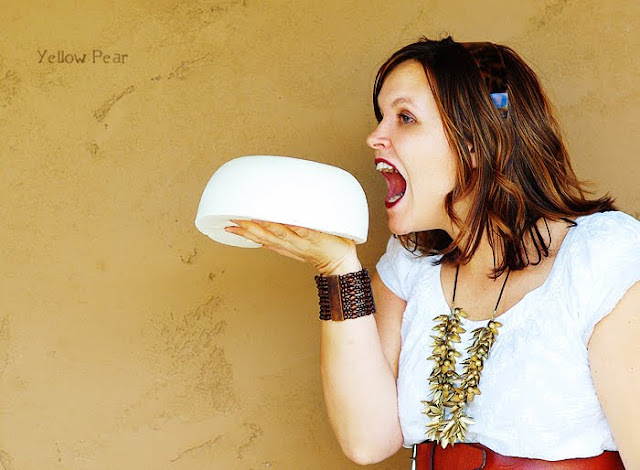 This is Jolene and the Giant Marshmallow...not to be confused with James and the Giant Peach. After dinner, we cut up brownies, Rice Krispies and marshmallow bits and served it up with some vanilla ice cream. Genius I tell ya Genius! And to think how delicious that marshmellow was after we all oogled and awed at it...mmmm germs...gotta love it. I didn't realize how BIG that was!! There wasn't anything in the original picture to reference the size to. But that lady eating it shows that it's flippin MASSIVE! I WANT one!!! I meant to guess on the cake, but I forgot. It turned out super cute. My guess would have been right on the rice krispies and brownie, but I never would have thought the marshmellow was real marshmellow! You're so creative! Wow! I really didn't think that cake was that BIG! GOOD JOB!